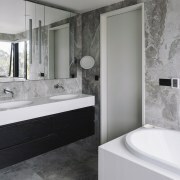 A floating vanity, toilet and bidet are teamed with large-format porcelain tiles and a glass-fronted shower to maximise the feel of space in this bathroom by designer Natalie Du Bois. 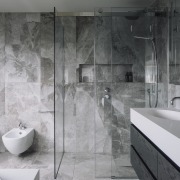 Boasting a veined patterning, the porcelain tiles have the rich look of marble but are easy to clean. 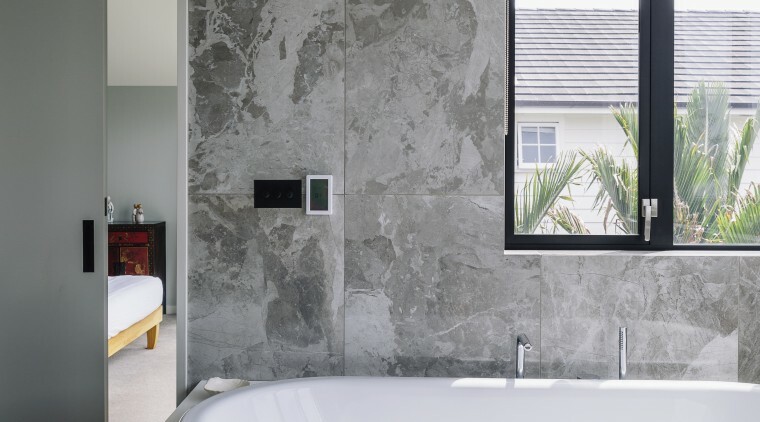 Increasingly, our bathrooms are places of serene retreat, and designing a bathroom with a spacious feel within a modest-sized home only adds to the sense of sanctuary. 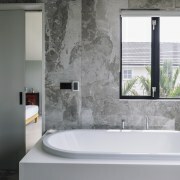 The owners of this smaller home asked designer Natalie Du Bois for a bathroom with the upmarket ambience of a refined hotel ensuite. Features were to include a his and her vanity, a walk-in shower and the luxury of spaciousness. "The high-end hotel feel was achieved in part by specifying large-format, marble-look tiles in a glossy finish on the walls and in a matt finish on the floor," Du Bois says. Hidden agenda this mirror-fronted wall cabinet above the vanity actually recesses back into the wall cavity, making it perfect for housing electric toothbrushes permanently plugged in as well as ample storage for make-up, skincare and cosmetics. A small round side mirror to the side has five times magnification is ideal for make-up application or shaving. "To achieve the required feeling of space, I floated the vanity, toilet and bidet off the floor. 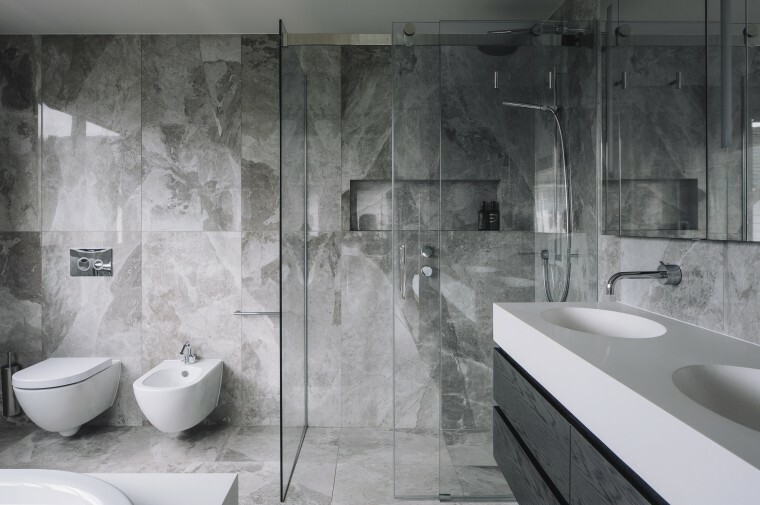 This design approach, together with the choice of the 600mm x 1200mm porcelain tiles, glass-walled shower and compact double vanity, makes the room feel more expansive than it actually is." Adding to the feel of luxury, the vanity is matched with sleek designer tapware. 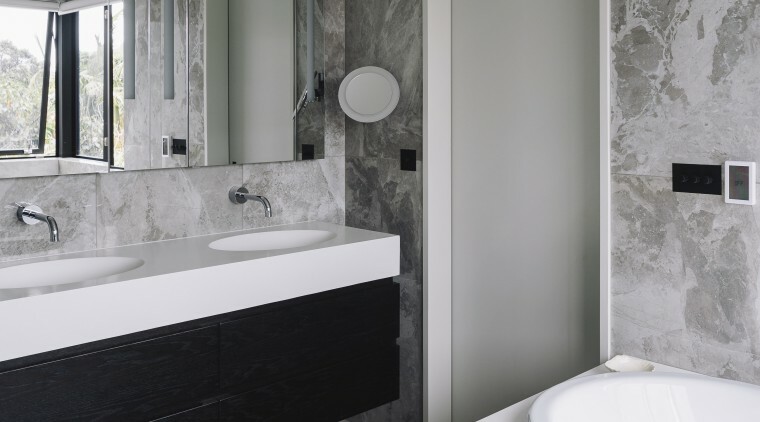 "The owners also wanted the space to be easy to maintain, so I designed a moulded Corian bath plinth that's fitted right up against the wall avoiding any hard-to-clean gaps." The all-in-one basins-and-vanity top is seamless, also making for easy maintenance. "The long vanity drawers offer plenty of storage which was another requirement of the design," says Du Bois. "However, the custom mirrored wall unit provides even more storage. This quite deceptive element recesses right into the wall cavity that backs onto the adjacent dressing room so its capacity is actually a lot more than you would imagine."